There’s nothing like a spanking new uniform to whet the appetite for learning. That was the gift to 90 learners from disadvantaged schools in the Nelson Mandela Bay metro. Some of the learners have never worn a uniform and it was smiles all round. Ten year-old Zukiswa Esterhuizen attends the Coega Primary School. She and fellow pupils proudly donned their new uniforms. “I am so happy with the new uniform and all my friends are happy with me”, says Esterhuizen. “This is a day I will never forget, the uniform will help us with our results because now we will find a reason for getting up in the morning,” added another learner, Likhona Malahla. “This programme will be sustainable, it’s a challenge in the rural Transkei but we are working with community members to bring change. It’s vital for government to pump in money to improve the standard of education in the province, this is a good initiative for us particularly contributing positively to learners,” says EC Portfolio Member on Education, Nancy Sihlwayi. This programme will be rolled out to other identified schools in the province. 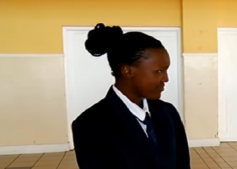 The post Disadvantaged learners in Nelson Mandela Bay receive uniforms appeared first on SABC News – Breaking news, special reports, world, business, sport coverage of all South African current events. Africa's news leader..